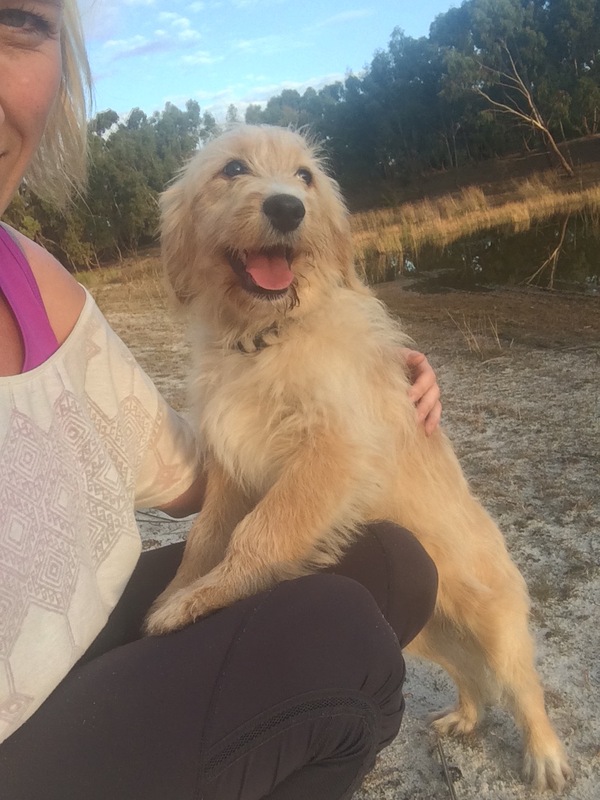 What does my Banksia Park Puppy learn when? When will my puppy grow up? Why does it seem like they are going backwards in their training and not listening? Why is my puppy growing at things they’ve seen a million times before? These are all questions that we are commonly asked by our Banksia Park Puppies families. 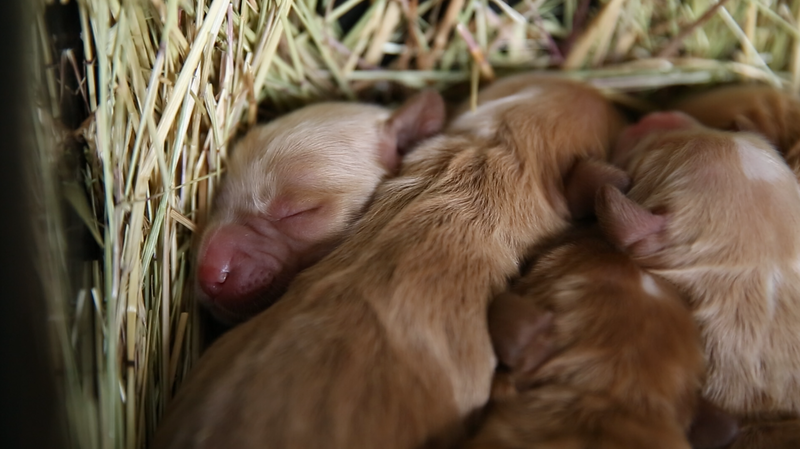 Did you know, that like human babies, puppies go through different periods of learning? 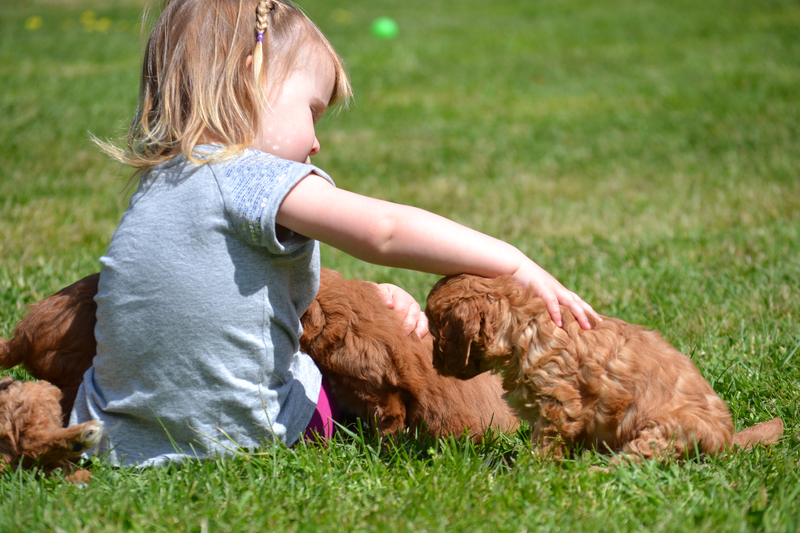 New owners should be aware of this so that they know what to expect from their puppies at each stage, and how best to deal with the changes in their puppy in each stage. It will also help you to train them to become life long companions with you and your family. Here are the different stages a puppy goes through, as well as what we do at Banksia Park Puppies to help them through each stage! I am only little and really need mum at the moment. I can’t open my eyes or hear anything yet, and can’t even go to the toilet without mum’s help! I need to have a constant temperature as I cant keep myself warm or cool. I crawl to mum and use tiny little cries to tell her I’m hungry. I really need mum right now to be close to me and take good care of me. I need to be handled very gently, and because I need mum so much she is going to be very protective over me, so forgive her if she is defensive! I can start to hear things now! I can also open my eyes and see some things but not really clearly yet. I think I’m big because I can stand up and wag my tail sometimes when I’m happy! My teeth are starting to come through though which doesn’t make me so happy sometimes! I can hear and see some things now, so I can start to be exposed to some new things. Small toys and things which make noises will interest me, as well as different surfaces to help me experience different things. 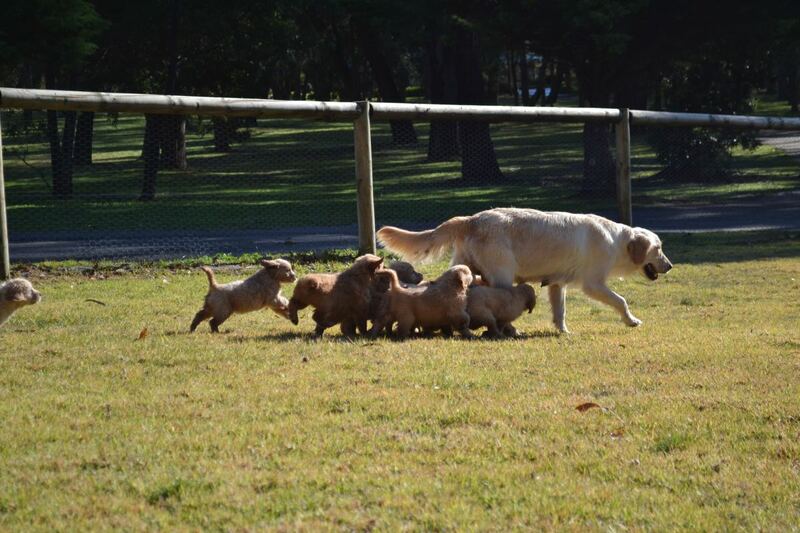 At Banksia Park Puppies we move to the nursery with mum. Mum has exercise twice a day for two hours each time with some of the other mums, and we have a rest and a play with each other during this time. The floors here are heated here in winter to make sure that I am always nice and toasty. We have fans as well to cool us in summer. The staff here start to play with me and give me toys that make noises such as pasta in bottles, or toys with bells inside them. All of my senses are developed now yay! I can walk around and explore my world now and play with my siblings. I can also start to regulate my own body temperature and need less help from mum (and everyone else taking care of me) to keep me warm and cool. I can even go to the toilet on my own, and eat food other than mum’s milk, so I’m on the road to being a big puppy! So much is happening in my life that I need everyone to keep things stable so that I am not too overwhelmed by all the changes in my life! Keep giving me toys and love but let me explore on my own too. 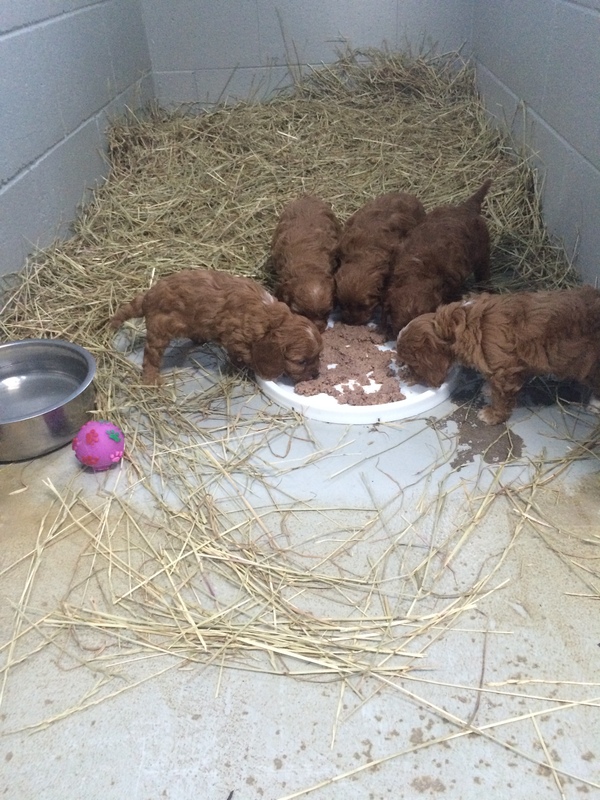 At Banksia Park Puppies I am having wet food as well as mums milk still. I still get given different toys constantly to be challenging me in different ways. The staff are interacting with me more and more and playing with me and my siblings. I’m learning alot now. Mostly from mum and my siblings. I’m learning how they react and how I should react, how to play, who is going to be boss in my family, and mum starts telling me off now when I’m doing something wrong! I need lots of time for mum to teach me all about the world and for me to learn through play with my siblings. Mum is starting to give me less milk, but I am eating alot of other food now too. Within this time at Banksia Park Puppies I am microchipped and vaccinated and checked over by a Veterinarian to make sure I am completely healthy. Now that I have had my vaccinations I come out and play with my siblings with the socialisation staff at Banksia Park Puppies, and with a family with kids to help me adjust to different surroundings. Mum gets more time away from me so I can slowly wean off her milk, and I get ready to meet my new family. This is one of the most important times in my life. This is the time where I can and will form deep bonds with the people who take care of me. I will love and care for these people my whole life! If I experience anything which makes me really sad or afraid, I may also be afraid of this my whole life. So please show me lots of love in this time! I need to be shown new situations with love. Take me to the Vet and show me that it’s fun! If there is a storm make sure I get lots of cuddles and do fun things so that I associate these experiences with love and not fear. This time in my life is very important, so please take this time to set me up for life with you. Banksia Park and Pines Puppies urge my new family to get me as close as possible to 8 weeks so that I can bond with you! I am playing and learning with the people at Banksia Park Puppies, but you don’t want to miss out on this special bonding time. The puppies who are staying at Banksia Park Puppies get lots of attention and playtime with the socialisation staff during this time. This is the time when I work out if I am the boss in my new house or you are. I am independent now and am keen to be the boss if you let me! I will test you to work out what I can and can’t do. Correct any behaviour you don’t wish to continue with positive reinforcement so that I know what is good behaviour and what I shouldn’t do. I will start biting and mouthing everything in this time! Telling me off wont do alot for this habit, so redirect this behaviour onto something that I am allowed to bite. A toy or bottle works well! At Banksia Park Puppies we get intense focus over this time. We are staying here at Banksia Park so we get alot of attention! We are taught how to play, and simple things like lead training and commands like ‘sit’ and ‘down’. We have lots of toys to bite and play with, and our own playgrounds to wear off some of our energy! I am going to start testing you again! Sometimes I wont listen (especially when you call for me) and I seem like I’m regressing a little bit. If you’re walking me, it’s best that you use a leash so that I know how far away I can go from you. Bear with me and continue the positive reinforcement, and the redirecting of behaviour – I promise, it will be worth it in the end! In the meantime though… keep your shoes and valuable items out of my reach! 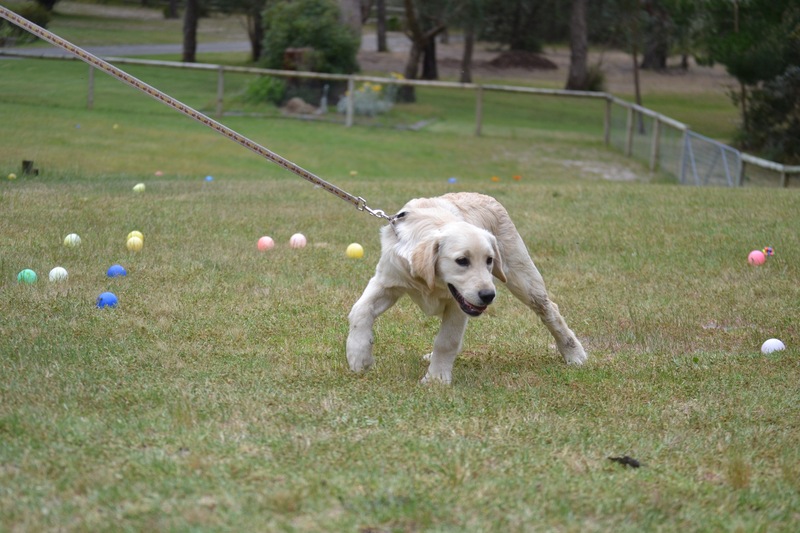 At Banksia Park Puppies we still have alot of focus and are moved into a yard with a friend and a playground. We are now right next to the agility yard and get plenty of time in there, and time playing with the staff here. The staff are reinforcing ‘sit’ and ‘down’ so that when I am rehomed later in life I understand these commands. I am going through alot of changes again and you need to look after me! I may become worried in some new situations, and even old ones which I have never been fearful of before. Stay positive, and use positive reinforcement rather than punishing me to help me during this time. Also make my new experiences fun. Give me treats or lots of cuddles when I am going or doing something new! I may start growling at new (and sometimes known) people. I may also start growling towards dogs or people and defending what I have come to know is mine. Let me know that I am safe and you are safe and help me to understand that things are ok.
At Banksia Park Puppies the staff put lots of effort into making sure that I am comfortable and happy. I also am around lots of different people so that I can learn to adjust to different situations with people who care for me. If you have trained me well, during this time that you will start to see the benefit! I will start to listen and obey commands (consistently!). I will be part of your family and will love you and be loyal to you. Thank you for helping me through all of my periods of learning! I’m sure it was as hard for you as it was for me! At Banksia Park Puppies I continue to come to the Agility Yard to play and exercise, and interact with different people and play with them. I continue to have different toys to play with and I always have a playmate to chase and keep me company. 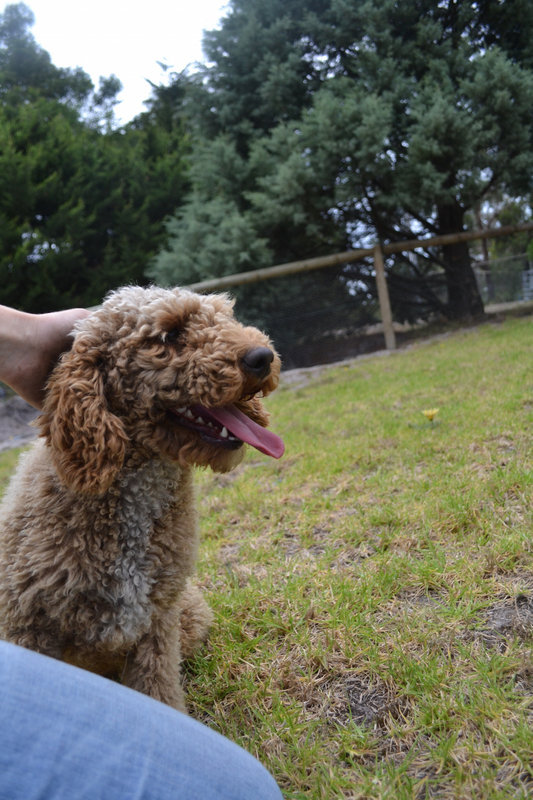 I am rehomed at around 4-5 years, and I have benefited through all of the socialisation that Banksia Park has focused on over the years.